In November 2016, Ale Industries (AI), a local brewery just down the road from the shelter, submitted an application to adopt two Cats on Patrol. This video shows the story of Amber and Porter, the newest four-legged staff of AI. Before arriving at AI, volunteers at the shelter worked hard to socialize Amber and Porter but after a couple of months, it was determined that they couldn’t be placed as pets in a family. 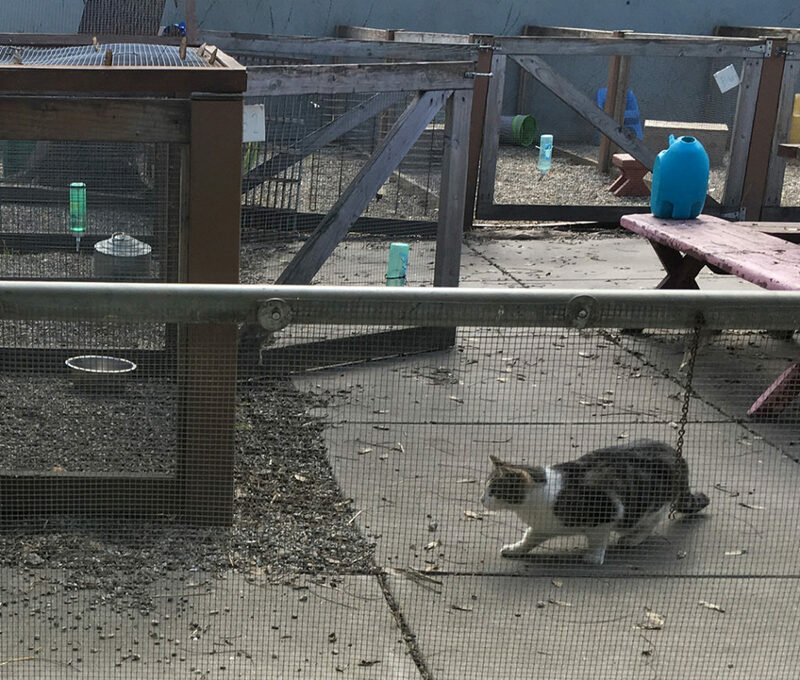 They were very shut down, didn’t respond appropriately to volunteer interactions, and showed behavior that were more typical of semi-feral cats. So they entered the Cats on Patrol program. We had no idea that Porter would blossom into a more social cat, as shown in the video. While we hope for this result for many of our Patrol Cats, this is not typical behavior of the cats in our program. Most will keep their distance but will happily stick around and continue to work for food! One of the shelter’s feral cats patrolling the grounds of Oakland Animal Services. Oakland Animal Services takes in over 2,000 cats annually from the community. Most are social house cats looking for new families, but a significant number are feral cats – similar to wildlife, not having had human interaction. Some of these cats may end up returning to their neighborhoods after being spayed/neutered, but others have no safe place to return to. These low-maintenance cats are part of our newest program, Oakland Cats on Patrol (OCoP)! Just because some cats have only lived a life outdoors, without people, does not mean they should be euthanized. 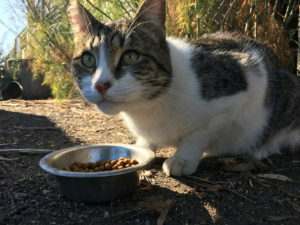 OCoP pairs people in Oakland (and beyond) who need eco-friendly rodent control with two or more feral cats looking for mousing work and a safe outdoor place to call home. OCoP cats are fully vetted – altered (no more kittens! ), microchipped, vaccinated, FeLV/FIV tested, and flea-treated. You just provide a room, garage, shed, barn, warehouse or other secure place for the cats to be transitioned for 2-4 weeks before allowing them to roam. OCoP cats will also need daily water, food, a secure area to sleep and, like any domestic cat, monitoring of their well-being. We place a minimum of two cats at each location, as feral cats are social with one another. Interested in adopting some OCoP cats, and having the joy of giving a life to a free-spirited feline?